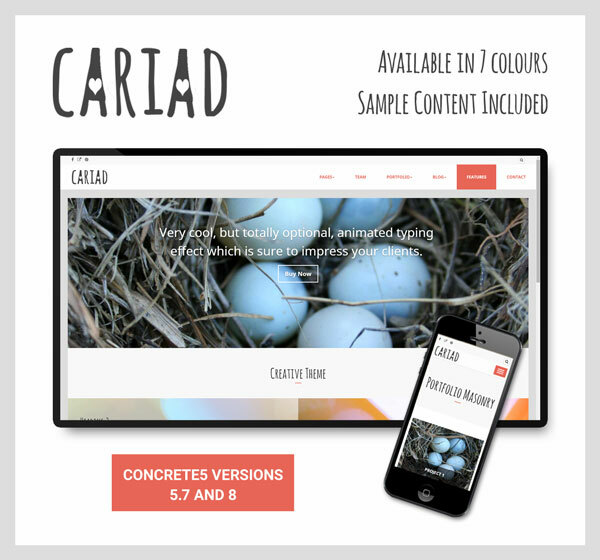 Cariad is a creative Bootstrap theme with a full width design and lots of useful features, such as an optional animated typing effect, custom blocks and templates. The theme comes with sample content, documentation, and many customisation options from the dashboard. Custom blocks, including an Accordion and a Button block. Support for animations. Includes Wow.js animations! 7 colour presets. Easily change your theme colours with one of our 7 presets: aqua, blue, green, orange-pink, pink, purple and red. User guide - step by step instructions included as a PDF in the Cariad package folder.